How do you use the Force of truth to break the hold of ignorance? 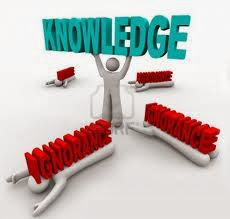 ‘Ignorance is a disease’ and nothing cures it more than knowledge. Only the force of truth can break the hold of ignorance. Below are answers that drive these points home. Truth is light. At times you have to just turn it on. Yeah! At times you do things you shouldn't do just because you aren't listening to someone telling you the truth. Or you just haven't told yourself the truth. Turn on the switch! This is the truth and choose to listen. Ask Questions: It was Dr Mike Murdock who mentioned in his books the importance of asking the right questions. It creates your season, your moment. Questions facilitate a genuine exchange between the Learned and the Learner, the Informed and the Uninformed. When you ask the quality questions you are on your path to receiving quality answers. Ask right questions from the right source today.The right question is a door way out of the cage of ignorance. Buy the truth. I remember the wonderful wisdom of King Solomon that advises about the need to buy wisdom, to buy the truth... So most times it will be important that you do buy the truth in books, in seminars, lectures, training and mentorship. Your investment in the truth is one of the greatest good you can do to yourself. Search for the truth. The truth is like a treasure, you have to search for and find it. When an organization does not know the truth about productivity and churning out excellent results, it will lack the desired excellent performance and the future will be bleak. But when it engages the knowledge and expertise of a consultant in that area of knowledge there will be a complete turn around.